If you’re buying a house, there are a few considerations you’ll have to make, including how many bedrooms and bathrooms you need, how many square feet you’d like, and whether you need a yard, to name a few. But one important feature than many people overlook is whether to buy a ranch home or a two-story house. Both styles have their strengths and weaknesses, and a ranch house can be a great fit for many people. What Is a Ranch House? Although many ranch homes look similar on the outside, the interior can vary widely. Some ranch houses for sale have high ceilings, sunken living rooms, open concept living spaces, etc., while other houses are more traditional. One of the biggest reasons many people search for ranch-style houses for sale is the lack of stairs. Ranch homes are perfect for elderly homeowners who struggle to climb stairs. Ranch houses are also nice for parents with young children who may accidentally fall down the stairs. Ranch homes are also more convenient for many people, since it’s easier to do laundry, move furniture, or do chores all on one level than to be hauling things up and down the stairs. 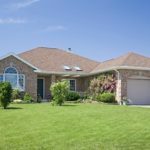 There are downsides to buying ranch houses for sale, however, including the fact that they require a larger lot and there are potential safety issues. Because two-story homes build up rather than out, they require less land on which to build. So with ranch homes, you’ll likely end up with a smaller backyard because more of the lot is being used for the house itself. Also, some people are concerned about safety issues with the bedrooms on the lower level—especially if a bedroom has a door to the backyard. While it’s still possible for someone to break into a two-story house, it’s unlikely they’ll be able to enter directly into your (or your children’s) bedrooms. If you’ve decided that a ranch house is right for you, the first step is to talk to your local real estate agent. They can help you browse ranch homes for sale, and they’ll also help you find your perfect dream home.